JPL, leading mobile app development company, was awarded Top Business App for its Carlisle Construction Materials Proposal Writer. JPL is a leading mobile app development company with expertise in strategy, user experience, development, analytics and digital marketing. JPL, a full-service marketing and digital agency, was awarded bronze for Top Business App in the Creativity International Design Awards. The winning business mobile app was developed for Carlisle Construction Materials. The Carlisle Construction Materials Proposal Writer provides a mobile solution to expedite and improve the process of estimating roof repairs. The app was developed to address a critical business challenge Carlisle Construction Materials saw in the length of time it took estimators to collect the information on site. Instead of taking several hours to estimate a job, the new mobile app enables estimators to deliver a high quality proposal to customers right from the rooftop. 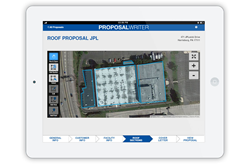 Estimators use the proposal writer app on iPads or Android tablets to draw on top of satellite images to denote sections of the roof that need to be repaired or replaced. Photos of rooftop deficiencies can be taken on the tablet from within the app so that the proposal shows facility owners the documented issues. The proposal writer app also enables the sales rep to generate a custom cover letter and review the proposal before sending it to a customer. The Creativity International Awards is an independent competition representing the best in advertising and design among agencies, designs, producers and directors from around the world. JPL received the bronze distinction among a field of well-recognized mobile app development companies. Carlisle Construction Materials selected JPL to develop the app based on their expertise and capabilities in designing and building user-focused mobile apps and mobile-optimized digital content. JPL is a leading mobile app development company with expertise in strategy, user experience, development, analytics and digital marketing. In addition to hybrid mobile app development, JPL is a full-service marketing agency providing strategic thinking and creative execution across a full range of services. Learn more about JPL’s mobile app development. JPL is one of Mid-Atlantic’s largest full-service, integrated, marketing agencies. The firm provides strategic thinking and creative execution across a full range of services that include brand, digital, marketing, advertising, hybrid mobile app development, video production and internal communications. JPL is a member of the American Association of Advertising Agencies (4 A’s). Their clients include leading regional, national and global organizations. Learn more at http://www.JPLcreative.com.